The book is not what I expected. What did I expect? 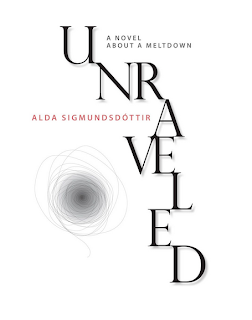 It's explicitly set against the background of the Icelandic kreppa, the meltdown of the banking system, and I expected that the events of the economic catastrophe would interweave with the collapse of the protagonist's marriage, acting, as it were, as a post-modern take on the pathetic fallacy. This doesn't really happen. The two collapses proceed at different paces and don't really counterpoint one another. Again, the protagonist's husband is the British Ambassador to Iceland. As such he had to be involved in the most startling development in the whole economic mess - the British government's (almost certainly illegal) decision to declare the Icelandic banks 'terrorist organisations' in order to freeze their assets. I had expected the protagonist to see this as a profound betrayal, something which would completely overturn all trust and respect she had for him. Again, it doesn't really happen. Would it have been a better novel if it had fulfilled my expectations? Read on. This book isn't really a novel about the meltdown, despite what is says on the cover. The (economic) meltdown happens, but it happens in the background. It's scenery, not plot. And it isn't even, really, a novel about the breakdown of a marriage. It's a caustic retelling of the Cinderella myth. Frida - the protagonist - is a girl from a poor background in Iceland. After a traumatic childhood, she escapes to London, where the course she had set her hopes on lets her down. In this vulnerable state, Cinderella - Frida - meets Prince Charming. He's rich, urbane, cultured, handsome, beautifully dressed, twice her age, and called - naturally - Damien. Damien, for me, didn't ring true for the first several chapters he inhabited. Filtered through Frida's eyes, he seemed a cardboard cut-out emotionally cold English aristocrat, almost a Fifty Shades of Grey character. But as Frida's own understanding and perception develops through the narrative, suddenly one sees why this sophisticated man would choose to marry a young woman at such a low ebb: he wanted someone malleable, whom he could mould, Pygmalion-like, into a perfect wife. This revelation is chilling, and makes the character of Damien more believable, if not more likeable. But this isn't a book about Damien. It's a book about Frida, and Frida's is a delicately and beautifully drawn portrait; she's a very fully realised, believable and - yes - likeable character. It's a book about Frida's growing up, a growing up which is delayed from her broken childhood and through the frozen years of her dysfunctional marriage, to flower quite suddenly against the stark background of Iceland's west fjords. And it is an interesting detail, I think indicative of the construction of this text, that the incident which sets her free to flower is a mistaken inference. I'm not sure, now, whether or not the failure to use the obvious counterpoint in a more formal way is a deliberate choice - 'I could do this, but I shan't' - I'm interested. It's not the choice I would have made. It isn't the novel I expected. But that does not make it a poor novel. On the contrary, it's a very fine portrait of a woman coming of age, and well worth reading for that.